Announcement Visit my new pillow shop at STUCKONHUE.COM! 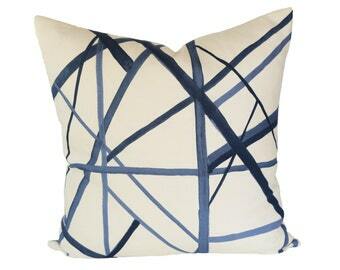 I love to see photos of Stuck on Hue pillows and pillow covers in your spaces! If you have a non-private account on Instagram, tag me in your photos for a chance to be featured on the shop account! You can also send me an Etsy convo with your photo or attach one to your Etsy product review. 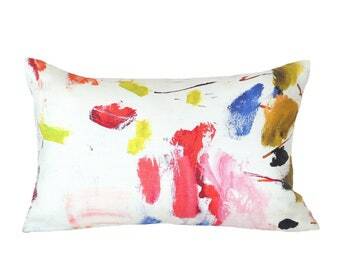 Visit my new pillow shop at STUCKONHUE.COM! Beautiful pillows! Hollie was very responsive and the quality is amazing. We purchased inserts larger than the cases per her recommendation and they look great. Love these pillows! Thank you for my gorgeous cushion covers with the navy linen backing and my placemats, they are perfect! Great communication with Hollie they arrived just as ordered and lovely packaged, would buy from StuckOnHue again. All "ready to ship" items are marked down at least 15% off regular price. Get 'em while they last! Kelly Wearstler Graffito Linen/Onyx pillow cover (18x18 with 20x20 insert) in the living room of designer Shannon Smith. Banana palm linen pillow covers (20x20 with 22x22 inserts) in the chic living room of Kristen from Bliss at Home blog. Orangerie pillow covers (18.5x18.5 with 20x20 inserts) in the colorful master bedroom of Cassie from Hi Sugarplum blog. Leopard velvet pillow covers (20x20 with 22x22 inserts) in the neutral bedroom of Julia from Cuckoo4Design blog. 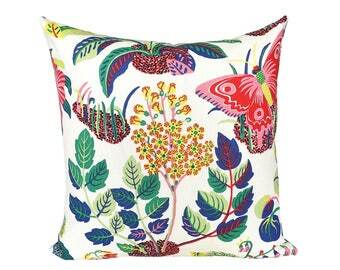 Stuck on Hue offers designer pillow covers in vibrant colors and patterns, custom-made with uncompromising quality. My goal is to help design-lovers create unique spaces that bring them joy. 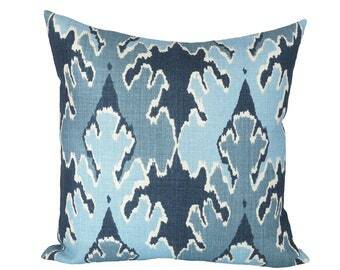 Stuck on Hue was born out of my passion for home décor, especially fabrics and pillows. I’m drawn to bold patterns and colors, which is reflected in many of the fabrics I have sourced for the shop. 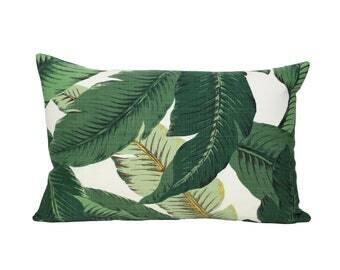 My curated pillow cover collection includes designer fabrics from iconic brands like Schumacher, Kravet and Pierre Frey, as well as indie brands like Flat Vernacular and LuRu Home. I have chosen to remain a small company of one, which means your order receives my personal attention from start to finish. 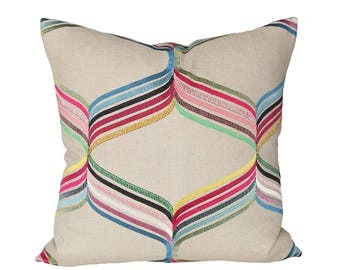 Whether you’re looking for a show-stopper pillow, or that perfect coordinate to make your pillow mix shine, I hope you’ll find just the right thing at Stuck on Hue to bring joy to your unique space. I wear all the hats at Stuck on Hue, including sourcing fabrics, cutting and sewing pillow covers, communicating with customers, and shipping orders, plus everything before, after, and in between. Pillows are on my mind 24/7! My pillow covers are made-to-order just for you! My current fabrication turnaround is 1-2 weeks prior to shipping. Need something sooner than my made-to-order timeline? I do have a few items labeled "ready to ship." These pillow covers are already sewn to a specific size and normally ship within 1-2 business days of purchase if ordered separately from my made-to-order items. Wish you could see a fabric's color or texture up close before ordering? No problem! I offer fabric samples for a minimal fee, and costs are refunded if you follow through with an order. Request fabric swatches here: www.etsy.com/listing/656639384. For pillow covers 18x18 and larger, I recommend you use a pillow insert two inches larger in order to give a full look and fill out the corners. For pillow covers 17 inches and smaller, I recommend a difference of one inch if you like a full look. If you need advice, send me a convo and I'm happy to help. 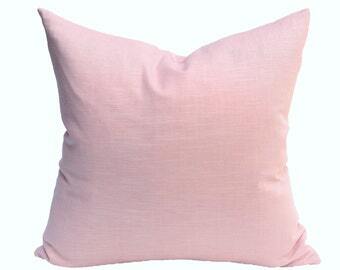 Wondering what size of pillow cover or insert is best for you? Most sofas look best with 20x20 or larger pillows. Sizes 22x22 and 24x24 are even better for a big impact and the coziness factor. Send me a convo (photos help too!) before ordering if you need suggestions for your space. I am happy to sell any of my fabrics by the yard or piece if you need it for a project. I can also order yardage on your behalf through my existing trade accounts with several fabric houses. Send me a convo with details and I can provide a price quote. Because my pillow covers are made-to-order to your fabric and size specifications, they are not returnable unless there is a defect. Quality is important to me, so please let me know if there is any problem with the product you receive. If you are unsure whether a particular fabric will work, please order a fabric swatch before ordering. Swatch costs are refunded if you end up making a purchase! If you want to cancel an order, please let me know ASAP. This is not a problem unless I have already cut or sewn your order. Kentucky residents will be charged 6% sales tax by law. My current fabrication time for made-to-order pillow covers is 1-2 weeks. You will receive a notice when your item ships, including tracking info. Most US orders ship via USPS First Class Mail. Depending on weight and size, some will ship USPS Priority Mail, USPS Ground, or UPS. International shipping takes a week to several weeks, depending on your location and the customs process in your country. My international shipping costs do not include customs, VAT or duty fees. Please double-check your shipping address before you place your order. Any address changes made after an order is placed need to be communicated to me directly. If your package is returned to me due to an incomplete or incorrect address, you will be responsible for additional shipping costs to reroute the package to you. I cannot be responsible for packages lost or mis-delivered by the shipping carrier, or stolen after delivery. Just send me the details of your request, and I'll get back to you with options and pricing. 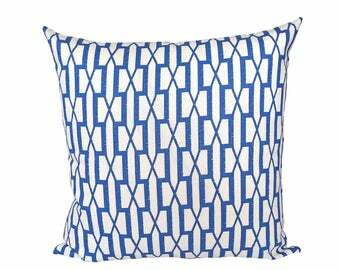 Unless stated otherwise within the listing, pillow covers should be professionally dry cleaned. Stuck on Hue enjoys working with designers, decorators, stagers, boutiques, and others in the design trade. Email hollie [!at] stuckonhue.com to request a trade account application.